Move the audio system in your Sanus steel component rack to the next level with the Sanus Rack Kit 2. By buying this product you'll earn up to 574 Rewards points. Move the audio system in your Sanus steel component rack to the next level with the Sanus Rack Kit 2. You get a CAPT01 multi-volt power supply, replacing all those "wall wart" AC power adapters your low-power components use, along with two 9-foot low-power cords. The CAPC01-B1 power conditioner minimizes the effect of noisy power on delicate equipment. Plus it filters electromagnetic and radio frequency interference that can hamper performance. This rack-mounted component is a great way to distribute power to as many as eleven audio/video components. It also features two CALW01 rack-mounted work lights. And the bundle includes a CAFQ01 rack-mounted ultra-quiet cooling fan to control the temperature inside your cabinet, as well as a CAVBP2 double rack space vented blanking panel. The Sanus Rack Kit 2 consists of the Sanus Power Conditioner and the Sanus Multi-volt Power Supply with two 9' DC power cords and a rack-mount fan and two work lights. Also included is a pack of 25 rack-mounting screws and an vented blanking rack panel (all individually packaged). 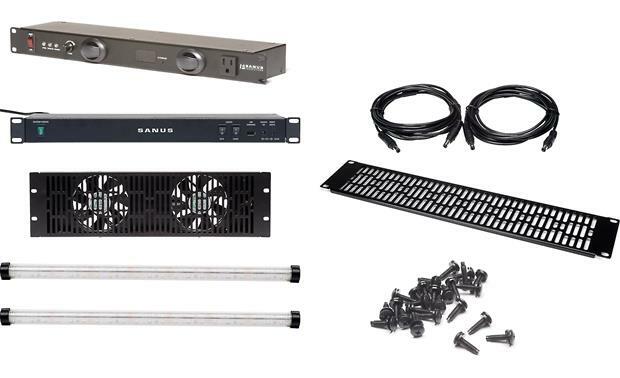 Bundle Overview: The Sanus Rack Kit 2 consists of a Sanus Power Conditioner, a Sanus Multi-volt power supply, a rack-mount cooling fan, and two work lights. It also includes two 9' DC power cords, a vented blank panel, and a box of 25 rack-mount screws. Dimensions: Width 19" Height 1.75" Depth 4.75"
Overview: The Sanus CAPT01 EcoSystem Multi-Volt Power Supply is a rack-mounted power supply for multiple low-voltage accessory components. It occupies a single rack space (1U) in a standard 19" rack. The CAPT01 supplies DC voltage for numerous fans, displays, front and rear lights, and powers and/or charges several devices via USB. The unit includes a thermostat kit which monitors the temperature inside the rack and automatically activates the connected cooling fans. The CAPT01 comes with a 6' AC power cord with an IEC 3-pronged plug, and a cable management channel. Thermostat Kit: The supplied thermostat is housed in a magnetic module that can be attached virtually anywhere inside the rack. It has a 6' cable that connects to the power supply via a 3.5mm miniplug. The CATG01 Temperature Gauge (available separately from the manufacturer) can be connected into the system to display the current ambient temperature. When the ambient temperature inside the rack reaches 85° (+/- 6°), the thermostat sends a triggering signal to the CAPT01, turning on the fans connected through any of the four DC outlets designated for thermostat control. The thermostat will cycle off at 70° (+/- 6°). The module is 1.5" wide x 1.16" high x 1.14" deep. Dimensions: The CAPT01's dimensions are Width 19" Height 1.75" Depth 4.625" (8" with AC cord). CALW01 Work Light: The Sanus CALW01, part of the Sanus EcoSystem, is an LED work light designed for use in an AV rack. The light contains a single row of 21 bright white LEDs for illuminating the rear panel of your rack-mounted components for easy viewing. The CALW01 can be mounted virtually anywhere using the integrated magnets or along the rack rails using the included plastic clips. The clips allow you to mount the light flush against the side of the rack, or at a 45° angle. This package includes two CALW01 LED light strips. Power Connections: Each CALW01 work light has DC power connectors on both ends, and come with 39" DC power cords. The CALW01 has a 12-volt, 0.14-amp rated input, and plugs into the Sanus CAPT01 Multi-volt Power Supply. Up to three CALW01 light strips can be daisy-chained together from a single power jack. The CALW01 does not have a power switch, but rather is turned on and off by the CAPT01 power supply. Sanus EcoSystem: The Sanus EcoSystem is a fully customizable accessory that serves as the single power source for all low-voltage equipment in a rack. The CAPT01 MultiVolt Power Supply powers the other rack accessories, including ventilating fans, equipment lights, and temperature gauges. Dimensions: Tube w/o clips: Length 14.85" Width 0.869" Height 0.676". 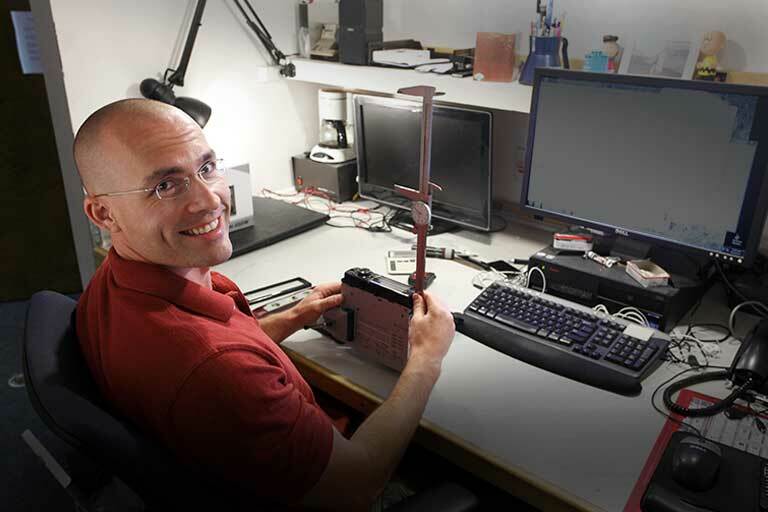 CAFQ01-B1: The Sanus CAFQ01-B1 ultra-quiet fan helps to cool the equipment mounted in your A/V rack. Two 4.5" diameter fans are mounted to a triple rack unit (3U) panel (for a standard 19" rack). The fan is powered by the Sanus CAPT01-B1 multi-volt power supply (not included), and is automatically activated by the thermostat kit (included with the power supply) when the interior of the rack exceeds a specified temperature. A 3' DC power wire is included. Dimensions: Width 19" Height 5.25" Depth 2.137"
Power Cords: The Sanus 12-volt DC power cords are used to power low voltage accessories in an A/V rack. The Sanus CAPT01-B1 Multi-volt power supply sends 12 volt DC power to work lights and cooling fans via these wires. This package contains two 6' DC power wires with barrel terminals on each end (5.5mm outside diameter, 2.5mm inside diameter). Rack Screws: The CASC25-B1 is a pack of 25 rack mounting screws. These are standard sized (10-32 x 3/4") rack screws with nylon washers to protect the finish of your A/V components. The screws have a durable black zinc finish with truss heads for easy installation. Blanking Panel: The Sanus CAVBP2 steel vented blanking panel helps to keep your audio-video components cool by maintaining consistent airflow throughout your AV rack. The panel can be used with any of the rack mounted cooling fans, or as a stand alone vent. The blanking panel occupies two rack spaces (2U) in a standard 19" rack. Searches related to the Sanus Rack Kit 2 Power supply and conditioner, vented panel, lights, and fan for Sanus component rack.